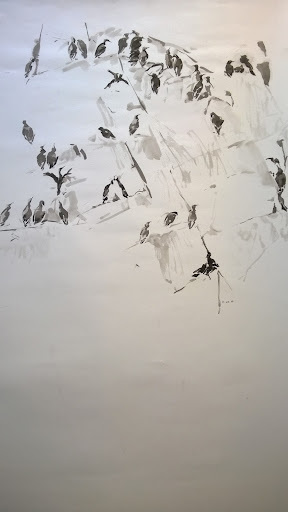 At Bull Hole today, I started an ink drawing of a stepped section of the loomery.Using three brushes with reservoirs filled with ink diluted with water to varying concentrations, I was able to work quite fast. I like the effect although it is a little over complicated for use in the field since it requires timing the period of drying between each wash. 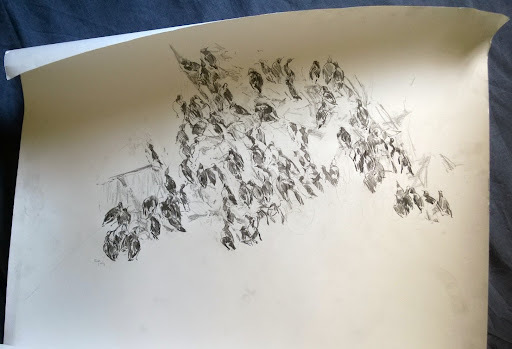 In the afternoon I decided to revert back to graphite although the ink method I was using with the reservoir brushes may be useful for making some of the exhibition pieces later on. The wind dropped in the afternoon enough for me to work higher up the cliff, which helped if only for a change of scene. This time I felt I was beginning to get my eye in, really understand the birds. I am working on a vertical format which immediately felt right because I am following the grain of the colony so to speak. The drawing is beginning to work. By around 7pm, the sun is low behind the cliff and it becomes hard to reliably make out the birds in a shadowy haze through the scope. 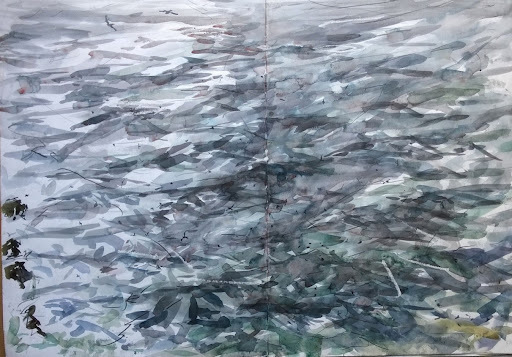 I finish the day painting the sea as a swell develops,reminding myself that this is the environment guillemots have evolved to thrive in. Translucent layers of colour in the water remind me of the crypt window by Keith New in Sheffield Cathedral.